The Leukoplast Elastomull Haft Elastic Bandage (8cm x 4m Roll) is a highly elastic, cohesive bandage that sticks to itself rather than the skin. With no fixation tape required, the Elastomull Haft elastic bandage is best used in conjunction with wound dressing and absorbent pads for comfortable wound protection. The highly elastic Leukoplast Elastomull bandage provides extreme flexibility, making it ideal for the active individual. Perfect for fingers, joints or other highly flexible areas, the Leukoplast Elastomull Elastic Bandage holds wound dressings securely in place for long-lasting comfort and protection. 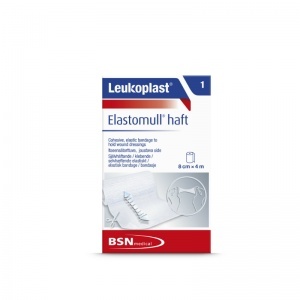 The Leukoplast Elastomull Haft Elastic Bandage sticks to itself, not the skin, offering quick and easy application. With no fixation tape required, the Leukoplast Elastomull Haft Elastic Bandages provide easy-to-apply, breathable protection. The Leukoplast Elastomull Haft Highly Elastic Cohesive Bandage (8cm x 4m Roll) is usually dispatched via First Class Royal Mail and delivery should be within 1 to 3 working days.